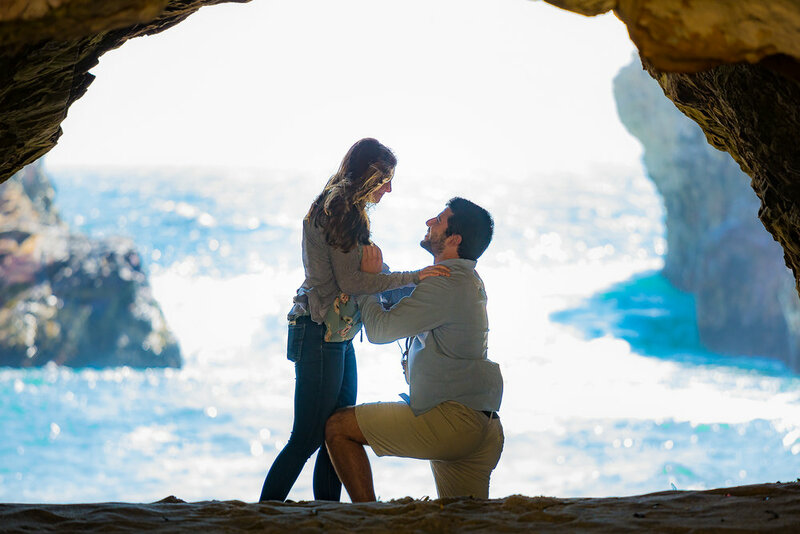 After visiting Shark Fin Cove one year ago, Nick decided that this will be the perfect spot to propose to Brianne, his girlfriend of three years. His mother was ecstatic about her sons plan to propose, wanting the moment captured for everyone to relive. Nick and Brianne arrived at Shark Fin Cove, he knew I was there, as I was the only person with a big 70-200 lens. I was pretending to photograph seagulls, which were nowhere in sight! Brianne had no idea what was about to happen. They walked along the beach for a while; coming to a stop inside the cave, away from public eyes. They took in the view hugging and talking. Nick then turning to Brianne got down on one knee, freezing that moment forever, Brianne said "Yes!" Congrats to Nick and Brianne! It was a pleasure capturing these beautiful moments for you!